CAN YOU STILL TANGLE YOURSELF INTO THE DÜLFERSITZ? They call him “Cepr” in Slovakia. By definition a person who moves only horizontally. When involved in a chat about climbing, often not scared of the climb itself, but much more scared of the height, depth and the subsequent getting down. Can often even be surprised by the fact that instead of down-climbing, climbers use the rope to descend to the ground. Our generation proves this to tourists quite effectively in Czech sandstone areas. This is possible thanks to all kinds of high-tech gadgets which have found a way into this particular sport. Well, when it comes to health, those folks with smart brains can come up with literally anything. It hasn’t always been like this, though. In the late seventies, abseiling eights infiltrated into climbers equipment along with securing tubes which started to appear a short while after. Not the subject of this article, for this is the present, known by every climber. Ropes were used for getting down from the peak long before the invention of these tools. You would only use the friction of the rope against your body to slow you down. Dülfersitz is the name of this particular old school method fondly remembered by old-timers. 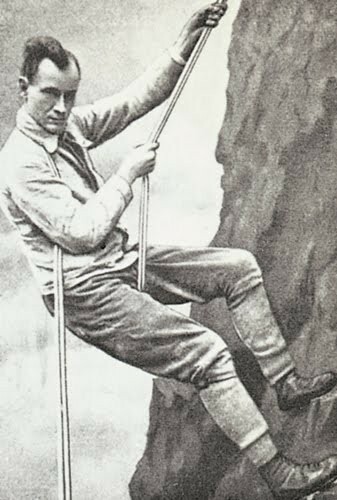 Who was this mister Dülfer, to have found the way of descending down the rope at the turn of 19th and 20th century, very little is known nowadays, even though he was a very significant climber back in the day. Hans Johannes Emil Dülfer was born in 1892 in northern German province of Rhineland-Westphalia, in the city of Barmen-Elberfel, known for its traditional pharmaceutical industry. Aspirin was discovered there. The Dülfers seam on Fleischbank (6-, 250m, „Pretty difficult, given its difficulty,’’ says the guide, Dülfer climbed it solo in 1913, editor’s comment). 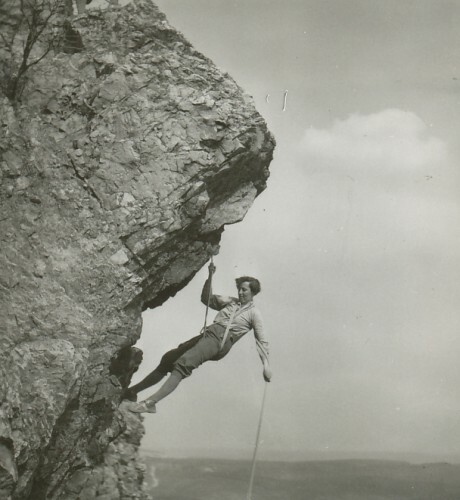 It is Hans Dülfer who is the claimed father of an abseiling method known as the Dülfersitz. It is also believed that he was the one to have invented the “layback climbing“, even though this was just because he was an early master of the technique. Dülfer died in the early age of 23 at the battle of Arras on July 15th, 1915. It’s been 101 years since his death. 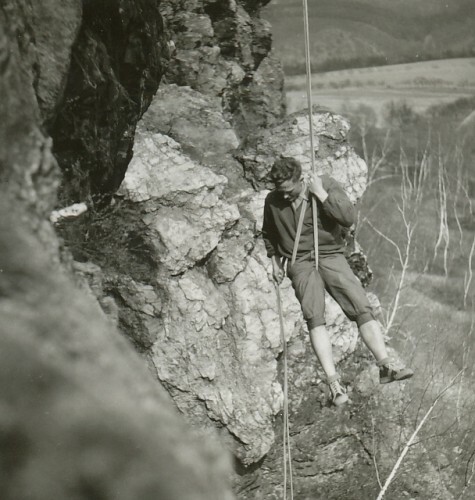 For quite a long time the Dülfersitz was the most common way of abseiling and it’s still remembered today, mainly with nostalgic memories of those gorgeous burns on the right side of your neck and shoulder along with some far less pleasant ones right next to your genitalia. 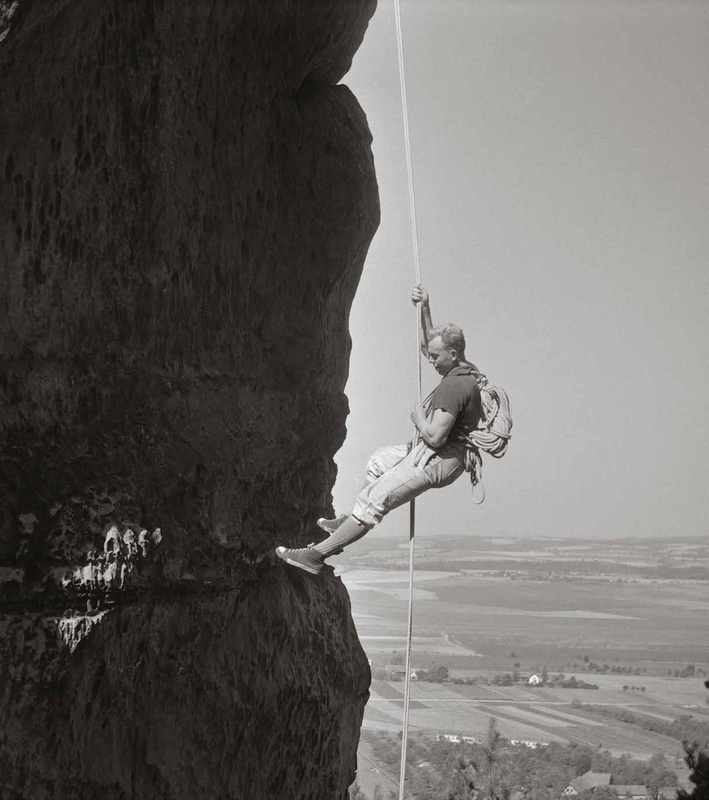 From all the books describing classic abseiling, the most compelling one is probably a Czech book about Josef Smítko called Friend from the Rocks, it’s written with a little bit of romance. This once very admired novel was published in 1958 in Brno and in it the life of Josef Smítka is described with a strong emphasis towards his fairly common, for the era, left-wing ideals. 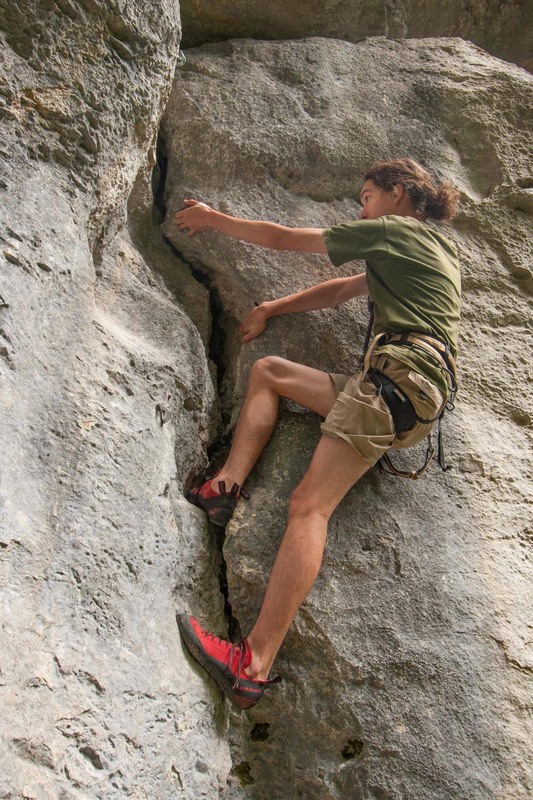 Politics aside, Josef’s climbing journey, mainly on the walls of Cruderocks is protrayed with the typical group of climbing friends – Chroust, Fifan and others, and is presented quite accurately. “The first abseil is like the first kiss. It’s vibrating, faithful and a bit bittersweet just like everything happening for the first time – it won’t be like this ever again. Your friends passed the rope through the ring to its halfway mark and tossed loose ends in the air. You feel a little pluck of the rope in the ring. Bam! Now you’re being tangled so hard that it makes you feel hopeless by the sense of helplessness and the lack of agility. You’re an entangled convicted felon before his execution. You stand with your back towards the deep that’s awaiting you. Finally adjusting of the rope around your leg, over your shoulder and your back, anything to postpone the moment that’s about to come. You can’t avoid it any longer – it needs, needs, needs to happen. You swing onto the rope. 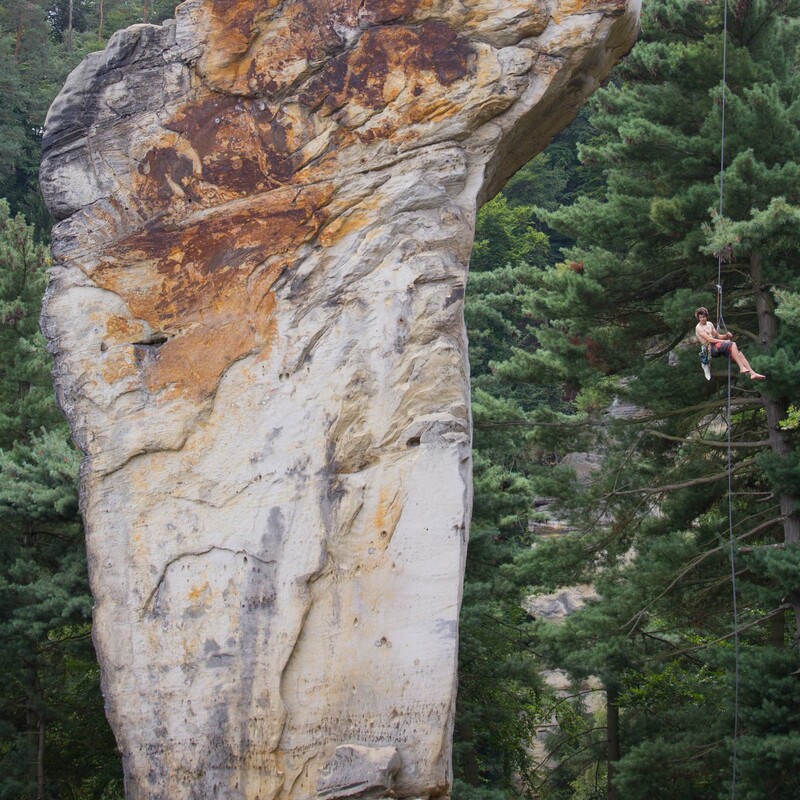 Like a big spider slowly going down, down… your legs find support in the rock. But then – the wall is getting steeper and steeper. You stretch your legs towards the wall, but it’s no good. The wall is getting away, leaving you at the mercy of the wind and your rope. You’re slowly, slowly starting to spin. Uh oh – here you are spinning like a carousel. You’re spinning faster and faster, the air full of yellow, green and grey splashes. That is all before the feeling of discovery, why do climbers have leather stitched on the back of their pants, wakes you back into reality. You pull one end of the rope closer to your back and let it slowly slip through your palms. Soft needles beneath your feet taste like wine. What’s more – you feel intoxicated. The first abseil is the beginning of a fever. You spend the evening rubbing your leg and neck with lip balm saying to yourself that next time you’ll bend your collar and wear something stronger underneath. 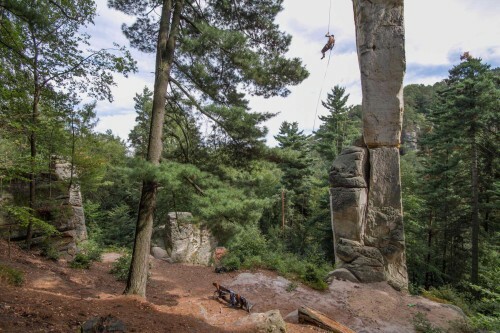 ’Well, if I had read this very terrifying stuff about abseiling as a beginner, I’d sure as hell never have gotten to my first attempt and would probably given up this sport right away. The reality is luckily far less dramatic and so we cheerfully abseiled all kinds of cliffs from the start. And how about when we even added those effective push offs of the rock! Crowds would stare at this remarkable show of “acrobatics’’ – naturally meant especially for the watching ladies – with their breath held. There’s not so much enjoyment in long abseils. One of great well-known examples is the Czech tower “Kobyla” – Mare. 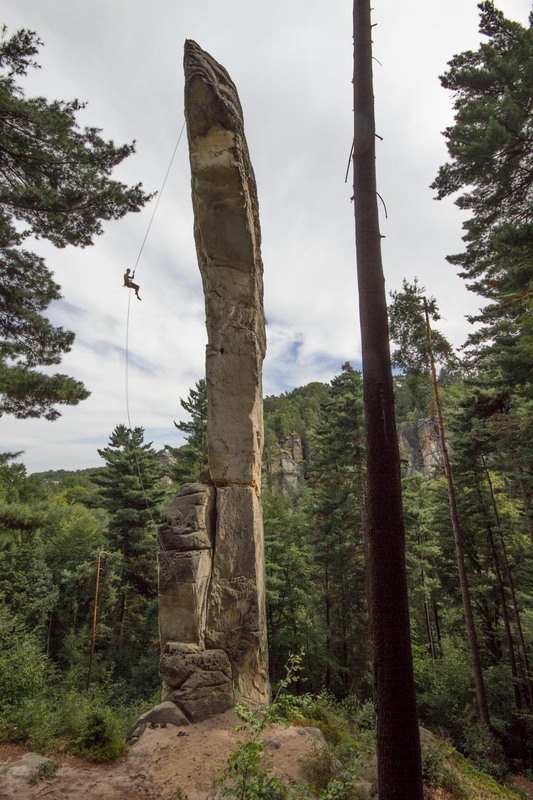 We would often fear it not because the routes were difficult, but because of the abseil, which led 30 meters in open air (the rappel ring is above the air, see photo above). It took some guts and skill to get down from the Mare. If you somehow got in the Dülfer the wrong way, there was no rescue shelf where you could rest and fix it. After we landed on the ground, we spent a good while pouring cold water on our necks. The passing rope made some nasty burns on certain places of our body which eventually forced us to come up with all sorts of protective devices. Our mothers would sew all kinds of mechanically resilient badges on our shoulders and bottoms at first, solid leather later served as a so called “tube’’– a piece of leather with strings at the ends for us to tie around our legs. We often remembered a report from one guide book: “When I die, I want my skin to be used for tubes’’. 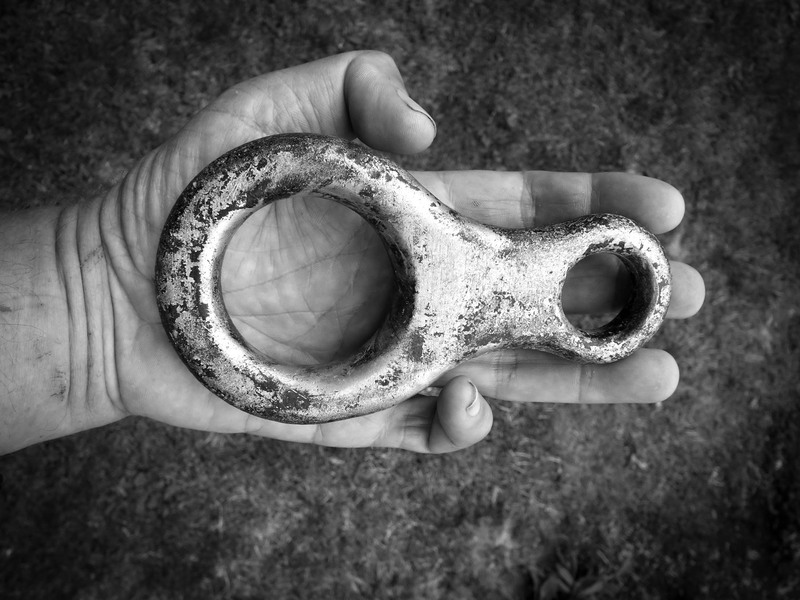 Someone also came up with another great tool; he would bring a watering hose, cut it on the long side and take it with him to the crag to use it as a groove for the rope. Stories about abseiling using the Dülfersitz method are common among climbers, even for Jaroslav Šmarda, who used to climb especially at Příhrazy crag, in famous Adrspach and in the Tatras. “It was a bit tricky at first when I was abseiling the Pillar with my good friend Václav Tichý. It starts with a 5 meter overhang that has to be passed through the air, before you get to the hob, where the changing ring is. I went first and made a belay underneath the overhang by the ring. Unfortunately, Václav Tichý tangled himself badly in the Dülfersitz which caused the rope to loosen and left him hanging in the air so that he was holding the rope only with his hands. Due to the lack of strength, though, he slowly started to slide down the rope which lacerated his hands quite a bit, since he had no gloves on. He started screaming in agonizing pain and ultimately, when he couldn’t take it any longer, let the rope go. From there it was about a 3 meter fall right on the loop that was tightened between the belay ring and me. I somehow managed to break his fall and grab him – the loop luckily held. Long story short, we both managed to climb down safely. Some other ways of threading your rope later naturally found their place, for example the first crazy czech style known as „to death“. You would pass the rope through your crotch and pass it around your waist. There is less friction of course, so you’d have to use some strength to slow yourself down. The only reason to use it is probably to show off in front of observing tourists and the ladies, for it kind of demonstrated your physical condition. Nevertheless, it is only used for the shortest abseils. Another similar method is a daring style “na turnováka” with its specific positioning of the rope not outside your legs, but dangerously between them. Once again, the friction is still smaller than with the Dülfersitz, therefore you slide a bit faster and still have to use your own strength. Thick pants and a collar around your neck are a must for this technique. You can see Guziš Záhora performing this particular method in the 1950s. Various attempts for further development eventually brought the use of ropes passed through snap-hooks in all kinds of ways as a braking engine. From there it was just a small step to the manufacturing of special fix device, which was the birth of the figure eight. Production started in the West and they were difficult to obtain in the Czech Republic at that time. Czech climbers made our own amateur pieces at home. It has been a long time since I got mine from a friend in Prague’s Waltrovka. It is made of heavy aeronautical duralumin and I still have it till this day. My friends were very thorough and worried about my safety, so they tested it on their industrial equipment and even at the weight of 7 tons it showed no signs of damage! It is common these days to abseil with eights and tubes along with many other modern tools, but make no mistake, should you forget these helpers in your backpack or drop them along the way, the Dülfersitz might be the best way to get down safely. The burning hot behind your neck and by your scrotum will only be remembered with good faith. The head of endoscope methods department and an old hand climber. He made his first route in 1967 and has never stopped. He has made a total number of 250 routes up to IXc (7a+). Sandstones still call him ad he answers.